Background and objectives Post-transplant lymphoproliferative disorders arising after kidney transplantation portend an increased risk of morbidity and mortality. Retransplantation of patients who had developed post-transplant lymphoproliferative disorder remains questionable owing to the potential risks of recurrence when immunosuppression is reintroduced. Here, we investigated the feasibility of kidney retransplantation after the development of post-transplant lymphoproliferative disorder. Design, setting, participants, & measurements We reviewed the data from all patients who underwent kidney retransplantation after post-transplant lymphoproliferative disorder in all adult kidney transplantation centers in France between 1998 and 2015. Results We identified a total of 52 patients with kidney transplants who underwent 55 retransplantations after post-transplant lymphoproliferative disorder. The delay from post-transplant lymphoproliferative disorder to retransplantation was 100±44 months (28–224); 98% of patients were Epstein–Barr virus seropositive at the time of retransplantation. Induction therapy for retransplantation was used in 48 patients (i.e., 17 [31%] patients received thymoglobulin, and 31 [57%] patients received IL-2 receptor antagonists). Six patients were also treated with rituximab, and 53% of the patients received an antiviral drug. The association of calcineurin inhibitors, mycophenolate mofetil, and steroids was the most common maintenance immunosuppression regimen. Nine patients were switched from a calcineurin inhibitor to a mammalian target of rapamycin inhibitor. One patient developed post-transplant lymphoproliferative disorder recurrence at 24 months after retransplantation, whereas post-transplant lymphoproliferative disorder did not recur in 51 patients. Conclusions The recurrence of post-transplant lymphoproliferative disorder among patients who underwent retransplantation in France is a rare event. Post-transplant lymphoproliferative disorders (PTLDs) represent the second most common malignancy in patients who have transplants. The relative risk of PTLD is 3.9-fold higher in patients who undergo solid organ transplantation compared with the likelihood of developing non-Hodgkin lymphoma in those remaining on the waiting list (1). The incidence rate of PTLD in the United States is 1.58/1000 patients per year in adult kidney recipients, which is markedly higher than that reported for non-Hodgkin lymphoma in the general population (0.19/1000 patients per year) (2). The main risk factors for PTLD after kidney transplantation include age (children and patients ages >60 years old), Epstein–Barr virus (EBV) seronegativity, and EBV mismatch (3,4). With regard to the immunosuppressive regimen, induction therapies on the basis of T cell–depleting antibodies are known to increase the risk of PTLD. In contrast, induction with IL-2 receptor antagonists does not seem to increase such risk (5). Moreover, the intensity of immunosuppression used for maintenance therapy (rather than specific individual agents) represents a key determinant in the pathogenesis of lymphomas (6). PTLDs encompass a heterogeneous group of disorders ranging from EBV-driven polyclonal proliferations to aggressive monomorphic proliferations (7). Approximately 70% of patients with PTLD are EBV positive, suggesting a key pathogenetic role for this virus in these malignancies (4). There is still no consensus on the most appropriate treatment approach for PTLD. In general, immunosuppressive therapy needs to be tapered off to restore an adequate antiviral and antitumor immunity. However, such a strategy can increase the risk of rejection and allograft loss (8,9). Anti-CD20 mAbs, chemotherapy, and surgical resection have significantly improved long-term patient survival, despite a high complication rate (10). PTLD remains a life-threatening complication that portends a high morbidity and mortality. In the French nationwide registry, the overall survival rates of patients with PTLD at 1, 5, and 10 years post-transplantation are 73%, 60%, and 55%, respectively (4). Because graft survival is generally compromised by the reconstitution of the recipient’s cellular immunity, rejection episodes are common (11). In addition, localization of PTLD in kidney graft is frequent, requiring surgical removal of the transplant in selected patients. Of the 500 adult kidney transplant recipients who developed PTLD included in the French nationwide registry, 95% had their immunosuppression reduced as part of their treatment, and 23 underwent allograft nephrectomy (4). Although retransplantation after the development of PTLD is theoretically feasible, no consensus on when and to whom such procedure shall be recommended exists. Published series on kidney retransplantation in patients who developed PTLD remain scarce (12–15). However, their results have been promising, with no PTLD recurrences being reported. Unfortunately, the criteria for identifying patients who are more likely to benefit from renal transplantation after PTLD have not yet been fully elucidated. Here, we retrospectively reviewed the data from all patients who underwent kidney retransplantation after PTLD in France using data from a nationwide registry. Specifically, we sought to investigate their characteristics and the risk of PTLD recurrence after the reintroduction of immunosuppression. Under a collaborative effort involving all of the French adult kidney transplant centers (n=35), we retrospectively collected data on all adults who underwent kidney retransplantation after the development of PTLD in France between January 1, 1998 and September 1, 2015. Patients with retransplantation were extracted from either the French PTLD Registry (4)—which collects the records of all patients with PTLD occurring over a 10-year period in adult French kidney centers—until the date of closing of the registry (December 31, 2007) or the Cristal database (Agence de Biomédecine) for patients who developed PTLD in periods during which the French PTLD Registry was not available. The records of 36 patients were retrieved from the French PTLD Registry, whereas 16 additional patients had their PTLD diagnosed either before (n=10) or after (n=6) the availability of the French PTLD Registry. The following data were collected from patient charts and the Cristal database: demographic characteristics of the recipient, date of first transplantation, date of PTLD diagnosis, PTLD characteristics (7), PTLD treatment, date of remission, date of inscription on the waiting list for the subsequent graft, date of retransplantation, immunologic and EBV status at the time of retransplantation, and immunosuppressive regimen. The study outcomes included recurrence of PTLD as well as graft and patient survival. We used data from patients included in the French PTLD Registry (4) to compare patients who developed PTLD according to the presence or absence of a retransplantation in patients who lost their graft, started dialysis, and survived for >1 year after the beginning of dialysis (a flow chart is shown in Figure 1). We compared kidney recipients with PTLD who were relisted for transplantation or retransplanted with those who were not relisted for transplantation. Of the 500 patients included in the French registry between January 1, 1998 and December 31, 2007, 107 returned to dialysis, and 86 survived >1 year from the beginning of the dialysis. Of them, 36 were retransplanted, seven were still on the waiting list, and 43 were not considered for a subsequent retransplantation. Patients included in the French Registry of lymphoproliferative disorders occuring after kidney transplantation. PTLD, post-transplant lymphoproliferative disorder. *Patients included in this comparative analysis. The clinical and research activities being reported are consistent with the Principles of the Declaration of Istanbul as outlined in the Declaration of Istanbul on Organ Trafficking and Transplant Tourism. The French PTLD Registry was approved by the Commission Nationale de l’Informatique et des Libertés (Paris, France; authorization no. 02.26). Informed consent was not obtained, because this was not a clinical trial but a prospective review of standard care. Descriptive statistics are presented as means, SDs, percentages of patients, and ranges of values (for normally distributed variables) or medians and interquartile ranges (for skewed variables). Comparisons were performed using the t test for continuous variables and the chi-squared test for categorical variables. All calculations were performed with the SPSS 11.5 statistical package (SPSS Inc., Chicago, IL). Between January 1, 1998 and September 1, 2015, we identified a total of 52 adult patients with kidney transplants who underwent 55 retransplantations after PTLD (three patients underwent two retransplantations) in France (Supplemental Table 1, Table 1). At the time of the transplantation at which PTLD occurred, 48 patients were adults, whereas four were pediatric patients (ages 5, 7, 12, and 16 years old at the time of transplantation). The transplantation that preceded the development of PTLD was the first for 49 patients and the second for three patients. The median time from transplantation to the development of PTLD was 80 months (interquartile range, 106 months; from 1 to 276 months). The general characteristics of PTLD are summarized in Table 2. 16 cases of PTLD occurred within the first 18 months after transplantation. Twenty-seven PTLDs were EBV positive, 78% were monomorphic, and 38 patients displayed B cell lymphomas. Immunosuppression was tapered off in all of the patients who developed PTLD. In addition, the treatment of lymphoma consisted of graft removal in 13 patients (of whom ten had graft PTLD), rituximab alone in eight patients, chemotherapy alone in ten patients, rituximab combined with chemotherapy in ten patients, radiotherapy in two patients, and surgery in five patients. The treatment was unknown in six patients. The median time from the diagnosis of PTLD to graft failure was 24 months (interquartile range, 69 months; from 0 to 152 months). The median time between PTLD and the registration on the waiting list was 65 months (interquartile range, 64 months; from 6 to 186 months). Finally, the median time elapsed from PTLD to retransplantation was 90 months (interquartile range, 71 months; from 28 to 224 months). Eight (15%) patients were relisted for subsequent kidney transplantation as a preemptive strategy. One patient was relisted during the first year after PTLD, whereas three underwent relisting within the first 2 years. When the 43 patients who were retransplantable were compared with the 43 patients who were nonretransplantable from the French PTLD Registry, we found that the former group was younger, had a PTLD more likely to be localized within the graft itself, and had a lower likelihood to have a PTLD in the central nervous system (Table 3). The mean patient age at kidney retransplantation was 51±12 years old (23−68 years old). The mean follow-up starting from the time of retransplantation was 67±50 months (0−186 months). Three patients underwent two distinct retransplantations. Of them, one lost his graft at day 2 post-transplantation because of vascular thrombosis. Forty-three (78%) recipients were immunized at the time of retransplantation (Supplemental Table 1). EBV serology was assessed at the time of the 55 retransplantations, being positive in 54 patients and negative in one patient. Epstein–Barr nuclear antigen IgG was measured in 44 patients (missing data for eight patients), and 38 (86%) of them were positive. EBV viral load was monitored in 25 patients (missing data for 17 patients). EBV viral load tested positive in 13 patients, and two patients had a high EBV viral load (4.7 and 4.8 log) at the time of retransplantation. Three of 46 patients had evidence of a monoclonal Ig at the time of retransplantation. Antiviral therapy was introduced after retransplantation in 24 patients (missing data for ten patients). Forty-eight (87%) patients underwent induction therapy for retransplantation (Table 4). Intravenous Igs and rituximab were used in 13 and six patients, respectively. The maintenance immunosuppression regimen after retransplantation (Table 4) consisted of calcineurin inhibitor in 55 retransplantations, mycophenolate mofetil in 54 retransplantations, and steroids in 52 retransplantations. Most patients received a triple immunosuppressive therapy. Nine patients were switched from a calcineurin inhibitor to a mammalian target of rapamycin (mTOR) inhibitor during follow-up. Six patients died during the follow-up. The causes of death were as follows: decompensated hepatitis C (n=1; 7 months after retransplantation), sepsis (n=1; 27 months after retransplantation), stroke (n=1; 39 months after retransplantation), hemorrhagic shock (n=1; 67 months after retransplantation), and cardiopulmonary arrest (n=1; 82 months after retransplantation). One patient died of septic shock after the start of chemotherapy for treatment of recurrent PTLD (24 months after retransplantation). In general, the subsequent graft showed a good survival. Five patients lost their retransplanted kidney for the following reasons: vascular thrombosis (n=1; day 2 after retransplantation), thrombotic microangiopathy (n=1; 138 months after retransplantation), BK virus nephropathy (n=1; 38 months after retransplantation), aortic dissection (n=1; 54 months after retransplantation), and allograft glomerulopathy (n=1; 8 months after retransplantation). One woman developed PTLD recurrence. After being on hemodialysis for autosomal polycystic kidney disease for 5 years, she underwent a first transplantation from a deceased donor at the age of 61 years old. The patient was EBV seronegative, and the EBV status of the first donor was unknown. Induction therapy consisted of thymoglobulin administered for 16 days. Cyclosporin, azathioprine, and steroids were used for maintenance therapy. A periureteral tumor was identified 9 months after transplantation. Biopsy revealed an EBV-associated polymorphic polytypic B cell lymphoproliferation (CD20−, CD38+ latent membrane protein negative [LMP−], Epstein Barr nuclear antigen 2 negative [EBNA2−], and Epstein Barr–encoded small RNA positive [EBER+]). Immunosuppression was discontinued, and treatment with aciclovir was introduced. Another biopsy of the kidney allograft was performed after 2 months. Because the results revealed a monomorphic B cell lymphoma, the patient underwent graft removal without any additional treatment. 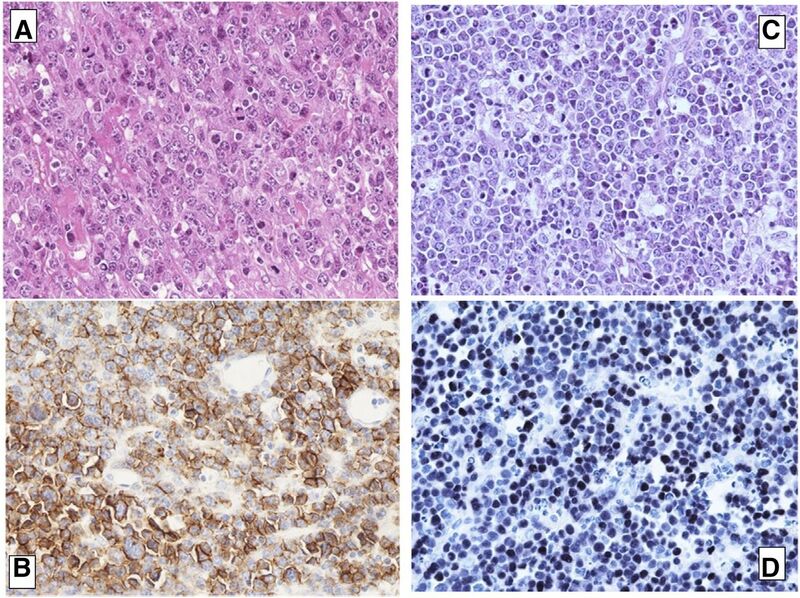 Final diagnosis was EBV-associated plasmablastic lymphoma with the following immunostaining features: CD138+, CD20−, CD79a−, λ+, EBER+, Human Herpes Virus 8 negative, and proliferation index Ki67 95% (Figure 2, A and B). Histological analysis of the first and the recurrent tumors showed features of plasmablastic post-transplant lymphoproliferativedisorder (PTLD). (A) First lymphoma, graft biopsy: hematoxylin and eosin staining showing features of plasmablastic PTLD. Original magnification, ×400. B. First lymphoma, graft biopsy: CD138-positive staining. C. Second lymphoma, lymph node biopsy: hematoxylin and eosin staining showing features of plasmablastic PTLD. Original magnification, ×400. D. Second lymphoma, lymph node biopsy: Epstein–Barr virus–encoded small RNAs in situ hybridization showing the presence of Epstein–Barr virus in tumor cells. A second transplantation was performed 28 months after the diagnosis of PTLD. Computed tomography scans performed 9 and 4 months before retransplantation yielded normal results. The patient continued to be EBV seronegative, whereas the deceased donor of the second graft was EBV seropositive. No induction therapy was given. Maintenance therapy consisted of cyclosporin, mycophenolate mofetil, and steroids. Prophylactic antiviral therapy with aciclovir was performed. Computed tomography imaging was performed at 4, 8, and 14 months after retransplantation, and no recurrences were detected. Eighteen months after transplantation, regular monitoring tests revealed high lactate dehydrogenase levels, and a computed tomography scan identified the presence of enlarged intrathoracic lymph nodes. Cyclosporin was discontinued, and rituximab was started at a dose of 375 mg/m2 once a week for 1 month. Unfortunately, a repeated computed tomography scan revealed disease progression. Cervical lymph node biopsy identified a monomorphic B cell EBV-associated plasmablastic lymphoma CD138+ CD20−, CD79a−, λ−, κ−, EBER+, Human Herpes Virus 8 negative, and proliferation index Ki67 95% (Figure 2, C and D). Chemotherapy with cyclophosphamide, doxorubicin, vincristine, and prednisone was started, and the patient died of septic complications. Unfortunately, the poor quality of DNA extracted from both tumors did not allow further molecular analysis. To our knowledge, this is the largest series to date of patients who underwent kidney retransplantation after the development of PTLD. Using our nationwide French data, we identified a total of 52 adult patients who underwent 55 kidney retransplantations after PTLD. Of note, these patients were younger and had less aggressive PTLD than those who were not retransplanted over a 10-year period in France. Although previous case series were small in size with short follow-up (Birkeland series, n=5; follow-up: 36 months ; Karras series, n=6; follow-up: 30 months ; Johnson series, n=23; follow-up: 24 months ; Rouphael series, n=8; follow-up: 62 months ), the results of kidney retransplantation after PTLD were generally promising, with no PTLD recurrence in these studies. Notably, the mean follow-up after retransplantation in our study was sufficiently long to allow the investigation of late PTLD recurrences. Although the results of our study indicate that kidney retransplantation after PTLD can be generally considered safe, we report the first case of PTLD recurrence in a patient after retransplantation. Previous studies have proposed some recommendations that may guide retransplantation after PTLD (12,16). With regard to the delay, recommendations stated that “a period of at least 1 year from control of PTLD to retransplantation should be allowed to minimize risk of PTLD recurrence if clinical need allows (Grade B, level 3)” (17). Clinicians may be willing to wait 12−24 months after the achievement of complete remission before considering kidney retransplantation. In our series, the mean time between PTLD and the registration on the waiting list was 76 months. The mean time elapsed between PTLD and retransplantation was 99 months (with the shortest interval being 28 months), suggesting that the current recommendations were correctly implemented for all patients. Albeit being the shortest interval in our study, the 28-month delay between PTLD remission and retransplantation occurred in a patient with recurrence (ultimately being longer than the currently recommended time interval). In the published literature, several patients underwent retransplantation after PTLD within a shorter timeframe, although no patients with PTLD recurrence have been reported. These observations suggest that other factors (e.g., EBV status) could have been involved in our patient’s relapse. With regard to the EBV status, the current recommendations state that patients should present an EBV seroconversion before retransplantation. Specifically, patients should test positive for Epstein–Barr nuclear antigen IgG (an indicator of an effective cytotoxic response against EBV) (18). In our series, the only patient who developed recurrent PTLD remained EBV seronegative before retransplantation. Six additional patients tested negative for Epstein–Barr nuclear antigen IgG but were positive for Viral Capsid Antigen IgG. Notably, none of them developed PTLD recurrence. It is currently recommended that EBV viral load should be low or—preferably—undetectable at the time of retransplantation. In our series, approximately 50% of patients had a positive EBV viral load. Of them, two patients had high EBV viral loads at the time of retransplantation, albeit without adverse consequences. Patients with a markedly high EBV viremia at the time of retransplantation should be closely monitored. In the post-transplantation period, a prolonged antiviral prophylaxis and serial measurements of EBV viral load may be helpful for reducing the risk of recurrent PTLD (16). Acyclovir and ganciclovir are capable of inhibiting lytic EBV DNA replication in vitro. However, neither agent displays in vitro activity against B cells latently infected by EBV. Nonetheless, the prophylactic use of antiviral drugs may reduce the risk of EBV-induced PTLD, with ganciclovir effects being more striking (19). In our series, antiviral therapy was performed in at least 24 patients. Two patients had evidence of monoclonal dysglobulinemia at the time of retransplantation. Specifically, one patient displayed a transient monoclonal gammopathy that regressed spontaneously, whereas the other presented with a persistent monoclonal gammopathy of undetermined significance. Albeit not invariably, the persistence of a monoclonal gammopathy may reflect an incomplete PTLD remission, whereas its disappearance suggests that a complete regression has been achieved (20). PTLD is currently conceptualized as a complication of transplant-related immunosuppression. To a large extent, the intensity of immunosuppression—rather than the use of specific agents—is the main determinant of PTLD. For this reason, reduction (or withdrawal) of immunosuppression is the mainstay of therapy (21). The rationale for this approach is that the recovery of the host’s immune system will elicit the development of a cytotoxic T lymphocyte against EBV, regaining control on the EBV-driven B cell proliferation. Retransplantation after PTLD treatment remains controversial because of the high risk of recurrence caused by the reintroduction of immunosuppressive therapy. The proper selection of immunosuppressive agents after retransplantation poses significant challenges. Most patients (87%) in our series received induction therapy after retransplantation. Surprisingly, the only patient who developed PTLD recurrence in our study was one of the six patients who did not undergo induction therapy. This observation suggests that other immunosuppressive drugs may play a role in the development of the PTLD recurrence. Current recommendations suggest that T cell–depleting agents should be avoided for induction regimens in favor of IL-2 receptor antagonists. Notably, the use of thymoglobulin significantly increases the risk of lymphoma compared with the absence of induction (5). Although patients were treated with thymoglobulin (because they were considered as high-immunologic risk recipients), the most common induction therapy in our series consisted of IL-2 receptor antagonists. Because this approach did not usually increase the risk of lymphoma, we believe that it should be helpful to reduce the risk of overimmunosuppression in patients who undergo retransplantation after PTLD. Finally, six patients received rituximab as part of their induction therapy. The use of this drug may have been part of a desensitization protocol in immunologic high-risk patients. Rituximab has been previously used in bone marrow or heart transplant recipients with high EBV loads for reducing EBV proliferation in lymphocytes, ultimately preventing PTLD (22,23). With regard to maintenance therapy, current recommendations state that the potential risk of PTLD should not affect the choice of immunosuppressant regimen (grade B, level 3) (17). Sampaio et al. (6) suggested that the increased risk of PTLD is mainly related to the intensity of immunosuppression rather than the use of an individual immunosuppressant drug. Furthermore, the exact intensity of immunosuppression produced by different regimens cannot be predicted a priori (6). Herein, the association between a calcineurin inhibitor, mycophenolate mofetil, and steroids was the most common maintenance immunosuppression regimen. Because triple immunosuppressive therapy for maintenance is known to increase PTLD risk (24), its frequent use in our series is surprising. Although we did not have information on dosing and trough levels of the drugs, we hypothesize the use of low doses and target levels after retransplantation. Because mycophenolate mofetil does not seem to increase the risk of PTLD (25), its use in our cohort was very common (98% of patients). The relationship between the use of mTOR inhibitors and the development of PTLD remains controversial. In vitro and animals studies have shown that these drugs may inhibit the development of lymphomas, but human and clinical studies have failed to confirm such evidence (26). In our series, only one patient received de novo therapy with an mTOR inhibitor, whereas nine patients were switched from a calcineurin inhibitor to an mTOR inhibitor. A major concern related to maintenance therapy is the avoidance of long-term overimmunosuppression. Fifty-one patients did not show PTLD relapse after their subsequent kidney graft. Notably, three patients who developed PTLD after their first kidney transplantation were retransplanted twice. After a mean follow-up of over 5 years from retransplantation, both patient and graft survival were good in our series. The one patient with recurrent PTLD merits comment. The immunosuppressive regimen received by this patient was overall mild. However, the recipient remained EBV negative at the time of second transplantation (when she received an EBV-positive kidney). This condition may at least in part explain PTLD recurrence, even in presence of low immunosuppression. The question as to whether the patient’s second PTLD was the same malignancy that occurred after the first transplantation or a newly developed tumor remains open. Graft PTLDs are generally characterized by a good prognosis, and transplantectomy is generally curative (4,27). Determination of the origin of tumor cells (donor versus recipient) would allow drawing more reliable conclusions on the biologic nature of the second PTLD (28). In conclusion, we identified a total of 52 adult patients with kidney transplants who underwent 55 retransplantations after PTLD in France over an 8-year period. Taken together, our data suggest that the recurrence of PTLD among patients who underwent retransplantation in France is a rare event. S.C. received honoraria from Chiesi (Parma, Italy) and Novartis Basel, Switzerland and had travel accommodations from Novartis, Fresenius (Hambourg, Germany), Sandoz (Holzkirchen, Germany), Astellas (Tokyo, Japan), and Sanofi (Paris, France). J.D. had research funding from Novartis and Astellas and travel accommodations from Novartis, Neovii (Rapperswil, Switzerland), and Boehringer (Ingelheim-Am-Rhein, Germany). O.T. had a consulting role for Grifols (Barcelona, Spain). M.B. had travel accommodations from Astellas and Novartis. D.A. had a consulting role for BMS (New York, New York) and Novartis Basel, Switzerland and travel accommodations from Novartis and Astellas. P.M. had a consulting role for BMS and travel accommodations from BMS, Novartis, and Astellas. L.F. had travel accommodations from Roche (Basel, Switzerland). E.A. had travel accommodations from Sanofi. N.K. received honoraria from Astellas, Novartis, Gilead (Forster City, California), MSD (Kenilworth, New Jersey), Neovii, and Amgen (Thousand Oaks, California); had a consulting role for Astellas and Novartis; and received travel accommodations from Astellas, Gilead, and MSD. A.D. received honoraria from BMS and Astellas; had a consulting role for BMS and Astellas; had research funding from BMS; and had travel accommodations from Novartis and Astellas. V.M. received honoraria from Astellas and travel accommodations from Sanofi. B.M. received honoraria from BMS and Astellas; had a consulting role for BMS and Astellas; participated in a speaker’s bureau for BMS, Amgen, and Astellas; received research funding from Alexion (New Haven, Connecticut), BMS, Astellas, and Chiesi; and had travel accommodations from Astellas, Chiesi, Alexion, and BMS. E.C., F.P., B.J., P.L., C.C., A.E.H., J.R., I.E., M.N.P., and A.K. had no conflicts of interest to disclose. This article contains supplemental material online at http://cjasn.asnjournals.org/lookup/suppl/doi:10.2215/CJN.03790417/-/DCSupplemental.